With markets continuing to make all-time highs, this actually is a good time to talk about scary markets, since we haven’t experienced a severe one in a while. For example, the CBOE Volatility Index (VIX), aka, “the uncertainty index,” is a generally accepted gauge of how confident (or not) investors are that the market is going to be volatile (or not) during the next little while. The lower the number, the smoother the presumed ride … although, as usual, there are no guarantees the markets will actually do as they’re told. As of December 4, the VIX was hovering in the range of 10–12. To put this in context, the VIX peaked at about 60 during the bear market of 2007–2009. You’d have to go back just over a decade to witness similar periods of relative calm. What should we make of these numbers? Scanning financial news, you’ll find the usual range of attempted interpretations: “We are worried about …” “Economic indicators suggest that …” “Geopolitical events are likely to …” and so on. What else is new? While it’s highly unlikely the VIX will remain this calm forever, nobody can predict when it might turn, or why or how dramatically it may spike back up when it does. As always, we counsel against shifting your portfolio in reaction to near-term forecasts. This includes prognostications of perceived volatility or lack thereof. Remember the Brexit? Instead, let’s use the relative calm as a perfect time to do a reality check on what scary markets really represent, and how to manage them when they occur. How well-prepared are you today, in anticipation of tomorrow’s market downturns? This brings us back to Buffett’s words of wisdom. Contrary to common perception, scary markets can actually be your friend. Some of your best returns are delivered in their immediate aftermath and, as Buffett suggests, there may be some “bargain” buying opportunities. BUT, you have to be there to benefit, which is why personal fear becomes your enemy if you panic and flee during the downturns. "Every decade or so, dark clouds will fill the economic skies, and they will briefly rain gold. When downpours of that sort occur, it's imperative that we rush outdoors carrying washtubs, not teaspoons. And that we will do." Market Returns – Are you taking on enough stock market risk in your portfolio to capture a measure of expected returns when they occur (often unpredictably and without warning)? Market Risks – Are you fortifying your exposure to market risks and expected returns with enough lower-risk holdings, so you won’t fall prey to your fears the next time markets tumble? Personal Goals – Have you assessed whether your current portfolio mix is optimized (risk vs. return) to achieve your personal goals? Speaking of goals, have yours changed recently, warranting portfolio adjustments? 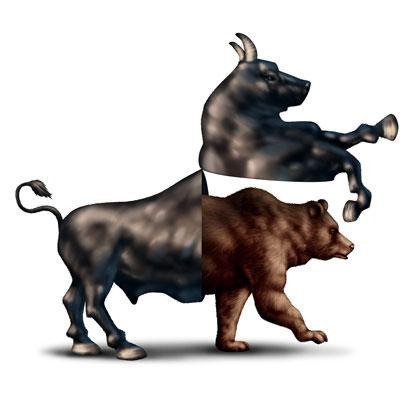 Personal Risk Tolerance – Have you been through past bear markets? How did you behave? If you discovered you’re not the risk-taker you thought you were (or, conversely, you sailed through with relative ease), does your current portfolio mix of safer/riskier holdings accurately reflect what you learned? Actual Portfolio Analytics – Have you carefully considered what a 30% or so market downtown would mean to you in real dollars and cents? Yes, it could happen. If it did, and you feel you’d be unlikely to hold firm with your current holdings, additional preparation may be warranted. In short, you can actually prepare for the next down market by having a well-planned portfolio in place today – one you can stick with through thick and thin. Neither too “hot” nor too “cold,” your portfolio should be just right for you. It should reflect your financial goals. It should be structured to capture an appropriate measure of expected returns during good times and allow you to effectively manage your personal fears during periods of market stress. We are by no means suggesting that the market is about to take a big dive. We don’t know what the immediate future holds any more than anyone else does. Then again, there’s never a better time than today to ensure you remain well-prepared for tomorrow. Let us know if we can help you design an investment strategy to minimize the risk of not achieving your future goals and maintaining a comfortable retirement.